Please right-click (or option-click on a Mac) the links below to download MP3s of some of the music and audio that we've discovered during Project Good Luck. 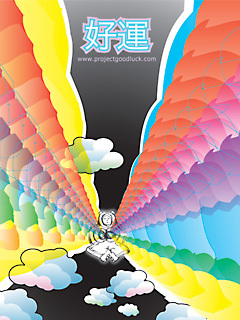 Please right-click (or option-click on a Mac) the links below to download wallpapers of the Project Good Luck artwork for your cell phone. This is where we post art, music, and other creations of ours for you to download for free! Want to add your own work for our visitors to download? Send us your stuff at contact@projectgoodluck.com and if we like it, we'll post it!